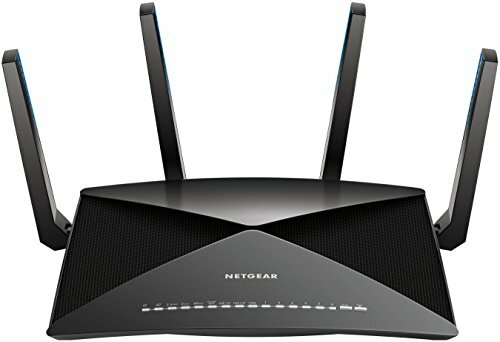 The Nighthawk X10 AD7200 Smart WiFi Router is industry’s fastest router for media streaming with Plex media server. The X10 delivers 802.11ac/ad WiFi for ultra-smooth 4K streaming, VR gaming and instant downloads. With a powerful 1.7GHz Quad Core Processor and Quad-Stream architecture, you can enjoy combined wireless speeds of up to 7.2 Gbps. MU-MIMO supports simultaneous streaming, while 160MHz doubles WiFi speeds to mobile devices. Four patent pending external active antennas amplify WiFi signals to maximize range and throughput. 6 months of unlimited backup to Amazon Drive secures precious data from USB storage connected to the X10 router. Plex Media Server - Use Plex to serve all your media from your external USB or NAS drive connected to your Nighthawk X10 router. Powerful 1.7GHz Quad Core Processor - Fastest processor for home router for better 4K streaming, VR gaming, surfing, or anything you throw at it! Nighthawk App - Easily setup your router. Manage Internet access by pausing and resuming internet instantly. Run a speed test. All from your mobile device!. Refer user manual for troubleshooting steps.